Carolyn Parkhurst is an amazing novelist; if you've never read The Dogs of Babel (2003) then you definitely need to add it to your wish list right away. Her ability to shock readers and to write characters so intimately is truly a gift. Octavia Frost is a bestselling novelist whose latest publication features re-writes of all the last chapters of all the books she's ever written and is entitled "The Nobodies Album". While en route to delivering the finished manuscript to her editor, Octavia catches a glimpse of a newsreel in which her famous musician son Milo has just been arrested for the murder of his girlfriend. Despite the estranged relationship between her and Milo, Octavia can't help but follow her motherly instincts and fly directly to Los Angeles to offer support to her son. Accompanying this storyline is the side-plot in which Octavia evaluates whether or not her family's past and Milo's upbringing has caused Milo's apparent meltdown. 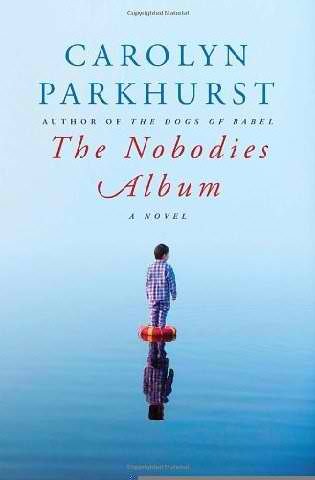 In addition, all of the final chapters from Octavia's "The Nobodies Album" are interspersed throughout Parkhurst's novel, revealing secret details about Octavia's and Milo's family past. book has been put back on the shelf?" Why yes, Octavia, it sure is, and readers will nod with approval upon accepting this truth, knowing right off the bat and feeling in their bones that Carolyn Parkhurst has a fascinating tale in store for us. 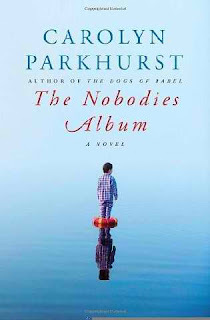 The Nobodies Album is undoubtedly an original piece of literature and the book within a book just adds to the richness of the plot. Carolyn Parkhurst has the same effect on me as does Dani Shapiro ; both authors write their characters so candidly, open and honest that you can't help but become emotionally involved. The Nobodies Album proves that family is what you make it; blood ties don't necessarily mean you know another person and that your intrusion into their life is always welcome. Parkhurst demonstrates how one must tread carefully when re-entering somebody's life after tragedy has torn apart the relationship. Carolyn Parkhurst's other novels are The Dogs of Babel (2003) and Lost and Found (2006). Sounds interesting. I have read both of her earlier novels. Dogs of Babel was definitely different but really good! Yes! Although Dogs of Babel was disturbing, I still really liked it because it was original.